With an ever-growing catalogue of intellectual properties from such a broad range of franchises, it’s fair to say that the Warriors series is steadily becoming the Funko Pop of the gaming world. Whether you love it or hate it, the Musou genre has, for quite some time now, faithfully catered to fans by stuffing as many references to the source material as possible while maintaining the underpinning gameplay structure that the series is so well known for. One Piece: Pirate Warriors 3 Deluxe Edition is no exception, ramming in more nods to the series than a fill-it-yourself plastic container at a Morrisons salad bar. If you have never played a Musou game, or even Hyrule Warriors: Definitive Edition for that matter, the gameplay premise is very straightforward. You basically run around a series of maps like an overpowered lunatic while bullying thousands of brain-dead enemies in order to occupy bases and show off new aggressive perks as you level up each character. There are a few side objectives thrown at you here or there, but the overall structure stays very similar throughout. The result is a button mashing medley of epic proportions as you shamelessly comatose massive groups of punch-drunk enemies in one fell swoop. It’s the perfect type of game to bash out on days when the world is against you and when all you want to do is feel like a winner. The story itself takes us back right back to the very beginning of the swashbuckling anime adventure. 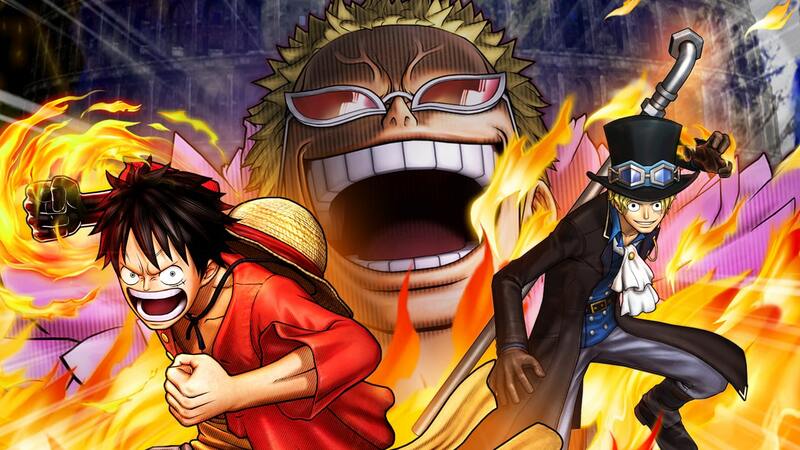 You interact with key moments from the series as Monkey D Luffy recruits the crew we all know and love in an effort to sail the Grand Line to obtain the greatest treasure known only as One Piece. Those who have been following the series can get a condensed reminder to reflect back on, while others who are new or curious to the world can still set sail into this easily enough as a rough primer to one of Shonen Jump’s biggest franchises. Of course, relying solely on the game to fill you in is somewhat a disservice to the anime, but with over 800 episodes to date it could prove difficult to catch up and it does a fairly decent enough job at giving you an overview in what the straw hat crew is all about. While all Warriors games play out almost identical to each other, each offering usually provides some sort of gimmick to differentiate itself from other than just the franchise its based on. In this case, you have a Kizuna system that allows you to combine forces with allies to unleash a devastating attack that’s so powerful, you could pretty much call it an act of genocide. Your crewmates can dive in with the shoe as a part of normal combos too, as well as the ability to swap between up to four assistant allies at any given moment. It gives you a sort of Marvel vs Capcom feel to it with brief, flashy cutscenes when you let loose the full wrath of your Kizuna attacks in succession. The cutscenes themselves are actually absent when working together in multiplayer, which does make sense to not interfere with the onslaught. Speaking of multiplayer, the local co-op works satisfyingly well with very little sacrifice to compensate for a fluid split-screen experience. Sure, there’s a slight drop in framerate and enemies can float a bit longer when under attack, but it doesn’t hinder the experience nearly as much as it did when playing dual screen in Hyrule Warriors on Wii U. In fact, the game runs very nicely overall, especially in single player where the frame rate seemed consistent and visually attractive even with hundreds of enemies on the screen at once. I did find myself enjoying the local co-op, especially due to how easy it is to organise and set up. The fact that you can split the Joy-Con adds to the convenience of it all with a few minor but practical button adjustments. What is missing is the online co-op that was present in the original release. Considering this is supposed to be the most complete edition of the game, it seems like the absence of this feature somewhat fractures the completeness just a bit. With regards to the content available, there’s plenty to do here to keep you occupied even though the core gameplay value stays as linear in execution as you would expect. There’s a Free Log mode that allows you to play previous story chapters with unlocked characters and a Dream Log mode, which loosely reflects the Adventure mode in Hyrule Warriors. In this mode, you hop between islands conquering each one for loot and unlockables. Each island, in turn, has a recommended character level to reach to give you an idea of its difficulty. I did find this mode the most fun and rewarding, as it throws tons of fun scenarios and treasures at you, including unlockable characters and plenty of currency to use at the beli shop. Being the Deluxe Edition, all the downloadable content has been included from its original release back in 2015. This includes costumes and bonus challenge episodes that were either made available as pre-order bonuses or paid packages that were marketed post-launch. While the content is as shallow as most forms of tacked-on downloadable content tends to be, it’s still a great inclusion for those who want to own it all. What does seem odd, is the decision to release this game a mere week before Hyrule Warriors: Definitive Edition drops across the western shores. Seeing as though One Piece: Pirate Warriors 3 Deluxe Edition was originally released at the tail end of last year in Japan, you would have thought they would have broadened the gap between the two Musou titles, especially with one being so prominent to the portable home console’s fanbase. The critic inside me could easily bang on about the game’s repetitive nature and lack of innovation from previous titles. However, what I found with One Piece: Pirate Warriors 3 Deluxe Edition is that it’s a game that I can play when I really can’t be bothered thinking. It’s also a game that my four-year-old daughter can get some satisfaction from, providing I steer her with a little navigational push. This may sound like I’m being sarcastic, but what really sealed the deal for me personally was that friendly rivalry between father and teenage son (who is a huge One Piece fan) looking to see who can murder the most pirates. Thus, making it a game that can cater for different conditions depending on whom I’m playing it with or what mood I am in. While it definitely won’t change your mind if you loathe the genre, One Piece: Pirate Warriors 3 Deluxe Edition does enrich the fan with a nerdgasm full of content while providing a simple, but somewhat therapeutic swabbie smashing experience.